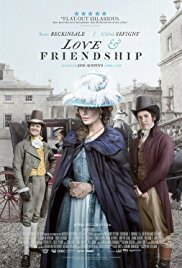 Lady Susan Vernon, recently widowed and possibly down on her luck, although it is difficult to tell, is forced by circumstances to become a house guest of her sister-in-law. Also staying in the house is the young Reginald DeCourcy, who, even though he is aware of Susan’s reputation as a flirt, and despite the warnings of his father, seems intent on marrying her. She is also keen to have her daughter marry the completely stupid Sir James Martin. Despite her charm, duplicity and negotiating ability it is not certain that everything is going to go Lady Susan’s way. Almost a continuous succession of scenes in country houses as the participants sit about exchanging witty gossip. At times the guys go riding and we see the them getting off their horses and having the grooms leading them away. The ladies travel about in a variety of coaches between the houses, and that’s it really. We wonder if anyone has actually got their gear off, or drunk anything or used bad language. That’s the point I suppose. A View The critics loved this and there is no doubt that Kate Beckinsale is as alluring in period costume as she is in black latex. You have to listen very carefully, and perhaps be a Jane Austen fan to get the joke which seems to be to send up the genre extremely subtly. If I’m honest I think there are one or two failings in the script, but that could be just me. So not quite a watch for everyone. Your choice! Source of story Loosely based on the Jane Austen novela “Lady Susan”. Additional Info A film apparently financed by Amazon to the tune of $3 million. It was shot in 26 days and made money.